Jason from Orlando Fun and Food recently had the opportunity to dine at the amazing Tchoup Chop at the Lowes Royal Pacific Resort at Universal Studios Florida. 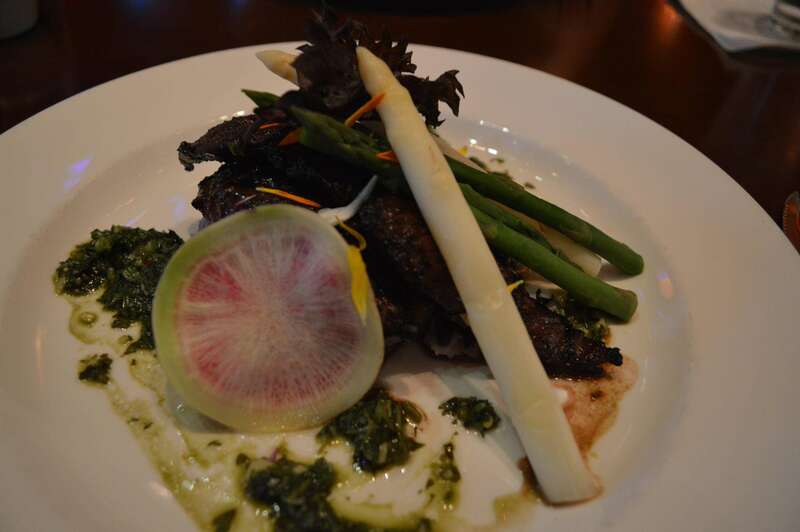 This pacific seas style restaurant is owned and operated by Emeril Lagasse. The name for the restaurant is a nod to New Orleans’ famous Tchoupitoulas Street, where Emeril’s flagship restaurant is located. 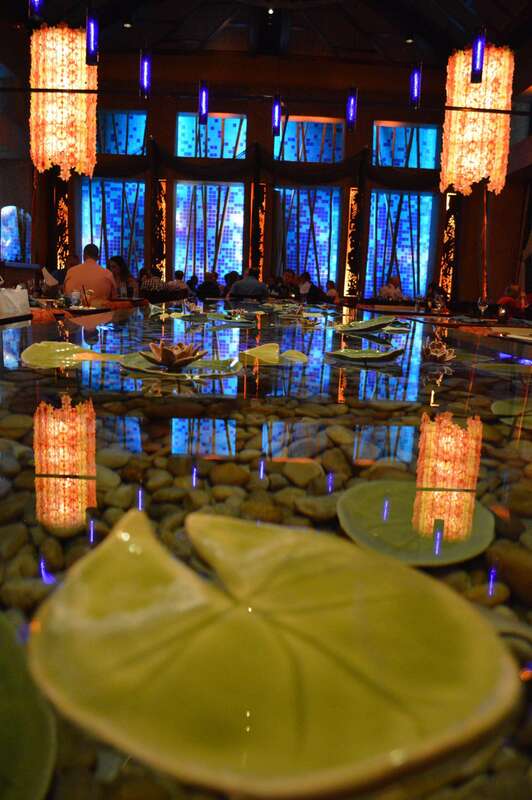 Tchoup Chop is an Asian-Polynesian fusion with an open concept kitchen so the guests can see the action as meals are being prepared. Valet parking is free when you eat here & it is located less than 50 yards from the entrance to the Tchoup Chop. 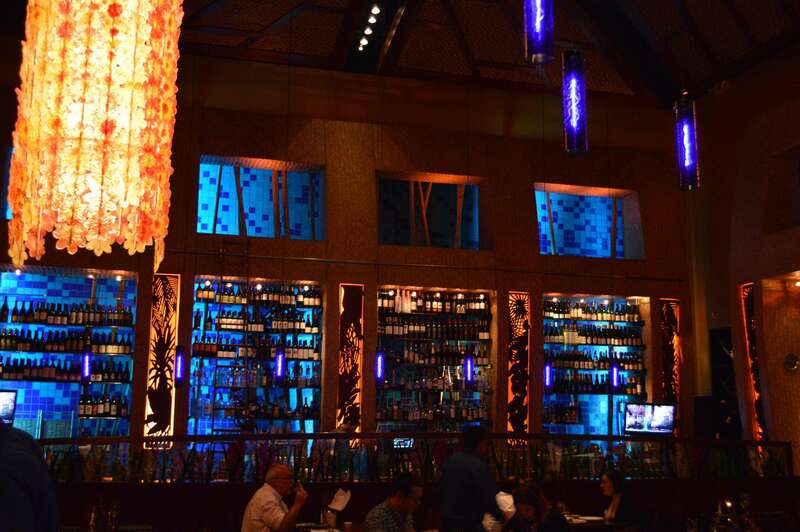 After entering the restaurant, we noticed the shear beauty of the restaurant from the open kitchen and the amazing decor with vibrant yet modern colors to the huge waterfall in the middle of the restaurant that seems to run the entire length of the dining room! After being seated beside the waterfall, I ordered some drinks to start out our evening. 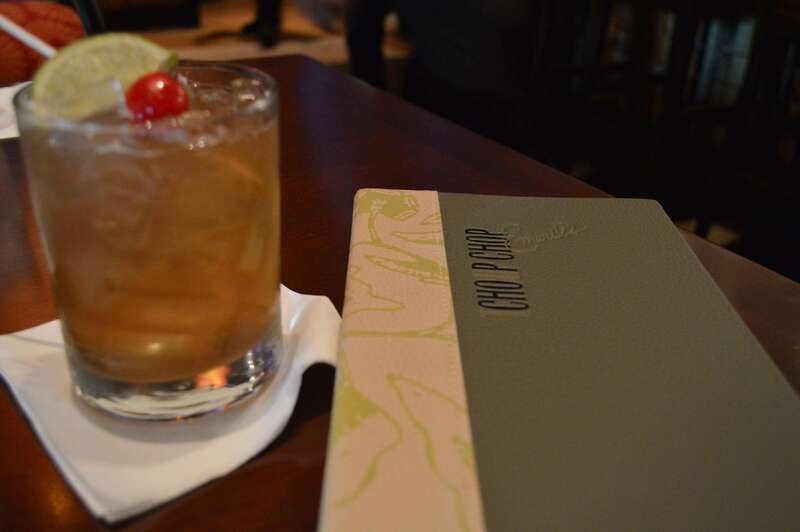 My girlfriend ordered the 1944 Mai Tai which really hit the spot. It was fresh, tasted great, and had a great mix of flavors. We knew after the drinks arrived that this place was going to be a favorite for us! I, with a recommendation from our amazing wait staff, ordered the Emeril’s Tchouptail. This is Tchoup Chop’s signature cocktail and a Chef Emeril favorite highlighting a mélange of vibrant citrus and thyme notes balanced harmoniously with a slightly dry finish featuring Sammy Hagar’s Beach Bar rum, Strega, Citrus & Thyme mix, fresh lemon juice, Elderflower syrup, orange flower water and egg whites. I know what you’re thinking and I was as well! Egg whites and thyme in my drink? Well, I am glad that I got past that because I have not had a drink as amazing as that one in a very long time! 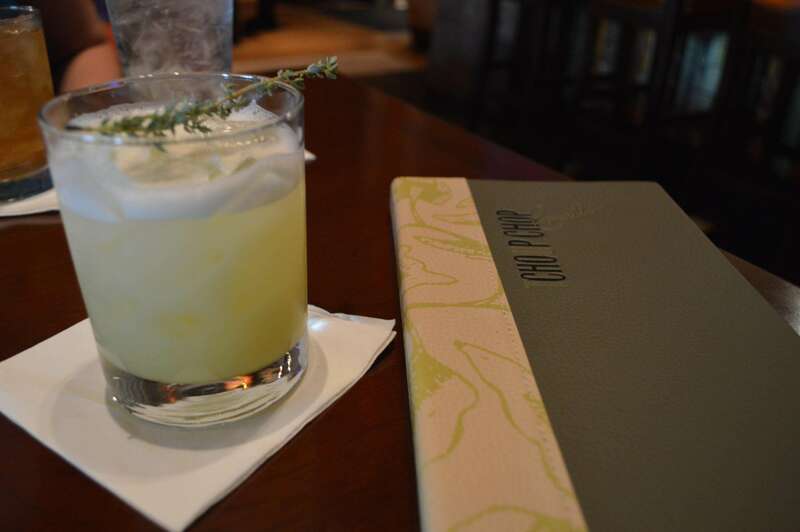 Emeril’s Tchouptail, my drink of choice! We started our food selections by having the coconut shrimp and the surf and turf sushi. 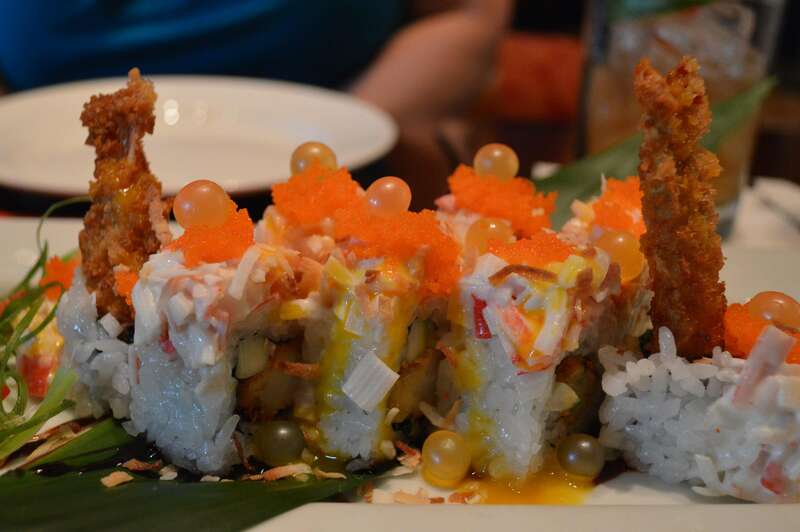 The coconut shrimp sushi had a great blend of Kani Kami, cucumber, cream cheese, masago, lilikoi, and kabayaki. This roll also had mango flavored balls like you find in bubble tea. These balls helped enhance the flavors and made it very tasty! 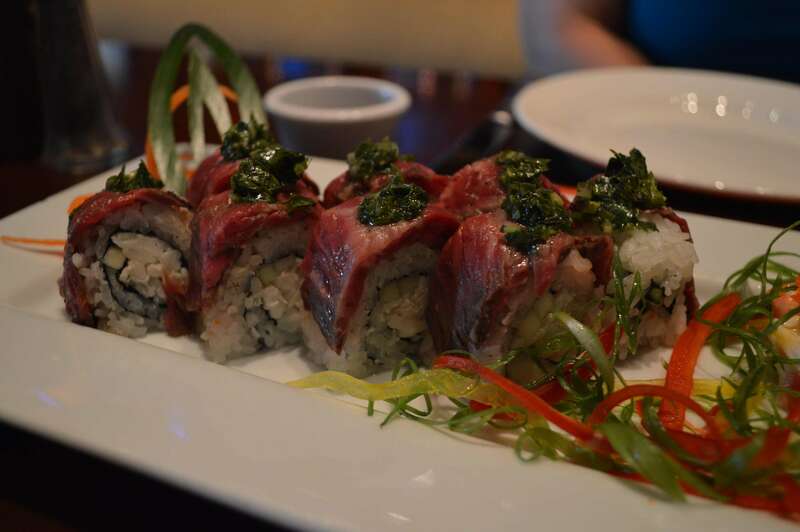 The Surf and Turf sushi roll had blue crab, cucumber, hibachi skirt steak, an asian chimichurri sauce, and white truffle oil drizzled on it. This was my favorite roll by far! It was bursting with a lot of flavor and had everything I like in a sushi roll! It is a must for me again! After our amazing sushi, we decided to try a variety of selections from the Robata. Robata is a grill used to cook and sometimes char meats, vegetables, and other foods. 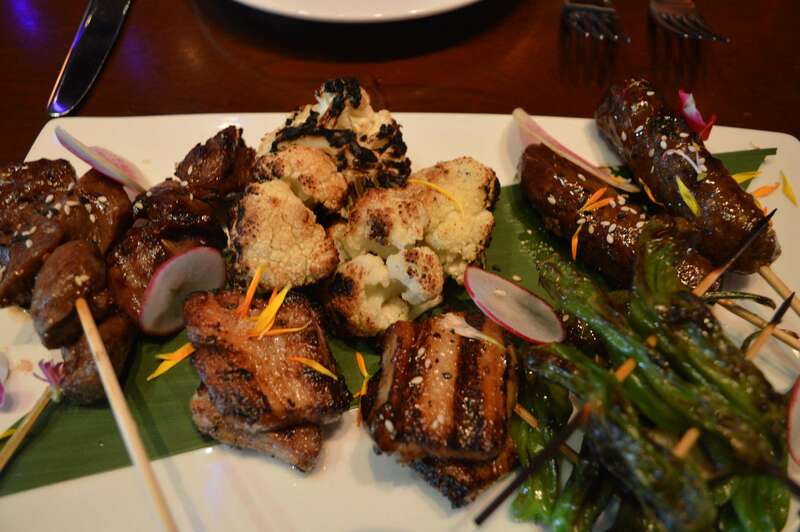 We tried a variety of thins from steak, pork belly, lamb, cauliflower, and shishito peppers. These selections are simple, yet delicious. Simple ingredients help bring forward the flavor of the meats and the vegetables. Who knew that cauliflower could taste that good?? For the main course, my girlfriend had the Sichmi Spice Mahi. 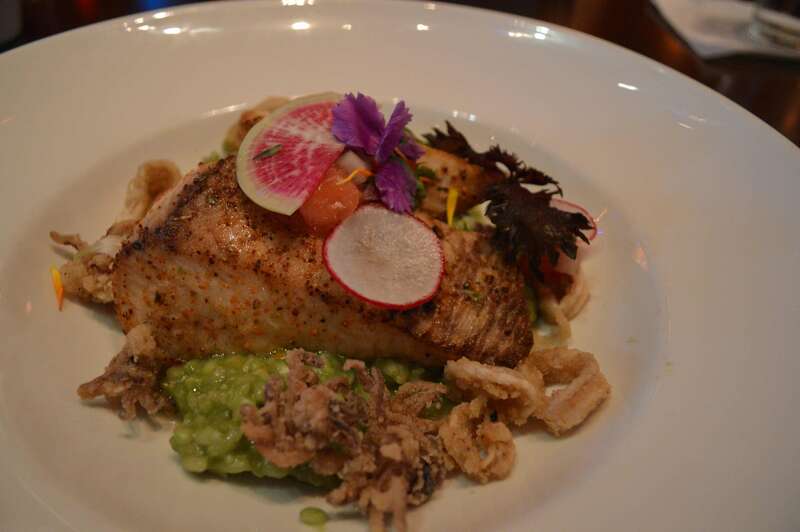 This dish included crispy calamari, coconut spinach “luau” risotto, and lomi tomatoes. She really loved the freshness of the fish, and the contrast of the risotto. I went with the Hibachi skirt steak. This dinner came with Okinawan purple smashed potatoes and wild mushroom “poke” topped with Asian chimichurri. I loved this meal. The steak was cooked to perfection and the sauce mixed with the potatoes was heaven! Just when we thought we could not have any more, the chef brought us a sampling of the desserts at the Tchoup Chop! 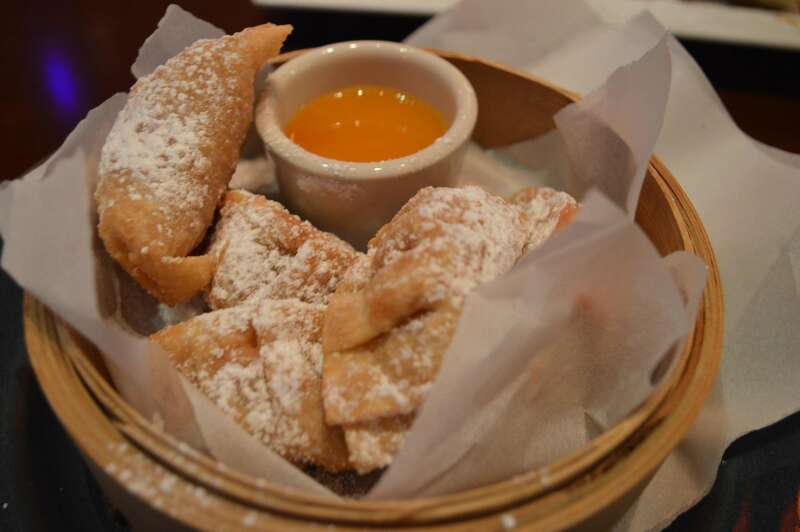 We started off by trying the crispy guava and cream cheese dumplings with a mango-lilikoi sauce. This dessert was killer! Great bold flavors, crisp dumplings, and who knew that a side sauce could easily become the talking point of a dish! 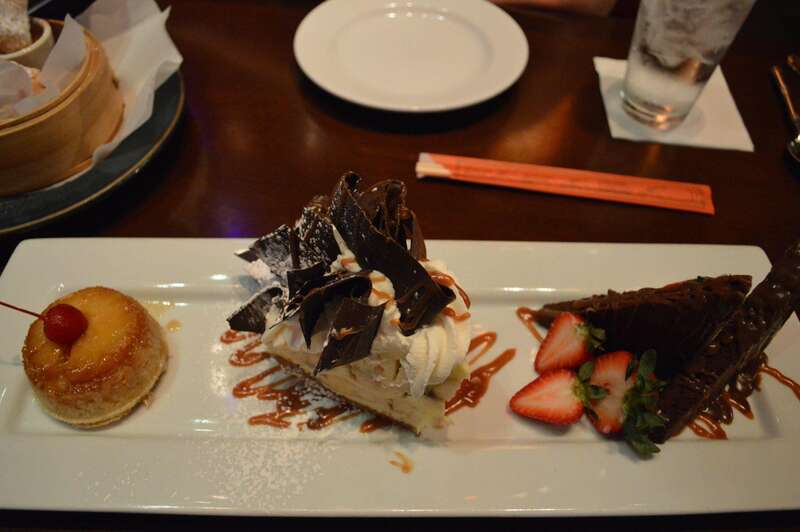 Next we had some pineapple upside down cake, Emeril’s famous banana cream pie, and chocolate kamora cake. The pineapple upside down cake was just as good as my nanny made! The banana cream pie with a banana gram cracker crust was amazing. I could probably eat a whole pie if I got the chance. It was covered in caramel sauce and a ton of chocolate shavings. Speaking of chocolate, the kamora chocolate cake had a peanut butter mousse filling and banana fosters sauce. All of the desserts were amazing and it would be hard to choose a favorite. If i went back and just ordered one for myself, I would choose the dumplings or the banana cream pie! Overall, the Tchoup Chop was amazing. The decor was beautiful, from the hand cut mosaic over the kitchen to the hand blown glass lights and, of course, the beautiful waterfall! The wait staff and GM were great and full of knowledge. The head chef came out to the table to talk to us about the dishes and himself. I must say that we had a great time speaking to him. From the interactions with the GM, chef, and wait staff, we knew that they loved what they did and cared about the food they were serving. Take away the beautiful surroundings, the view of the modern kitchen, and give me a rude staff, and this place would STILL be worth dining for the food! The food was downright amazing! I have eaten a lot of Asian and Polynesian foods and by far the Tchoup Chop blew them all out of the water. Add back in the staff and beautiful atmosphere and you have yourself a great restaurant. Hands down, the Tchoup Chop is the best food found in my opinion on Universal Studios Orlando property! If you haven’t been to the Tchoup Chop, make sure you make reservations and go ASAP! This food is way too good to pass up! Make sure you tell them Jason from Orlando Fun and Food sent you!